T ara Singh Vachani, 26, has seen the ups and downs of business from very close quarters. 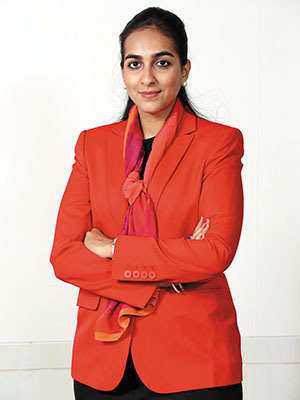 Consider that when she was growing up, her father Analjit Singh was building the formidable Max India empire. But even that could not prepare her for the disappointment in 2012, when she set about implementing her dream project. Not that Vachani hadn’t done her homework. Right from the beginning of her entrepreneurial journey in 2010 as CEO of Antara Senior Living (a subsidiary of Max India), she travelled extensively, researched and brainstormed on what she thought was the first-of-its-kind initiative in the nascent senior living sector in India—a ‘community’ for the elderly in Dehradun. But when Vachani approached local authorities for the necessary clearances, she was stumped. Her project fell into none of the categories for which licences were allocated. “There was no concept called senior living in India. And when it came to residential housing, there was no specific provision for this,” she says. A licence could be issued under the residential housing category, but that would critically alter the design and layout of the community, including the requirement of 1,200 slots for car parking when just about 250 were needed. Despite the setback, Vachani didn’t lose heart. Between countless visits to government offices where she sipped pots of tea, Vachani and her team reworked the plan. “I made six presentations, 30 pages each, lobbied and engaged with the secretariat,” she says. She got a break when the chief town planner suggested that the licence could be given in the category of ‘community service’. It was a godsend. Among other things, this brought down the number of required parking slots to 880. “Apart from improving my Hindi, I learnt what to say and what not to say. I learnt how not to be defensive when others are not going to see your vision,” she says. By early 2013, Antara’s first project was passed by the state government, clearing the decks for construction. If everything goes according to plan, the 20-acre community for elders in Dehradun will open its door to 200 guests in 2016. By then, the company would have made a capital investment of Rs 500 crore. Remarkably, it is expected to break even on the first day itself. “The model is such that we would recover the investment through long-term leases on the houses in the community,” says Vachani. Ranging from Rs 2 crore to Rs 7 crore, each of the houses comes with customised services. Household chores—from laundry to maintenance of cars—would be handled by well-trained staff. The community also includes a wellness centre with nurses and doctors. It might be a bit too early to celebrate the success of the project but for Vachani, takeaways from the experience transcend all profit margins. While there have been previous attempts to offer services specific to senior citizens in India, none came close to Vachani’s vision. “Many of the initiatives in the space have been from real estate companies. For many, it is a marketing spin—the most glaring shortcoming is in the service aspect of these offerings,” says Sumeet Bhalla, director, business development, Antara. Vachani was sure that by filling the gap, she had a strong business case for a profitable venture. A serial entrepreneur who has mastered the art of spotting opportunity—he made nearly Rs 600 crore in 1998 by selling his stake in Hutchison Max—Singh knows a thing or two about building a sustainable business. “An acute understanding of key differentiators of the business, right execution, and surrounding yourself with people who are smarter than you, are the critical requisites for a successful enterprise,” he says. Vachani has followed that advice to the T.
Just after she returned to India in 2010 after completing her graduation from Singapore, Vachani became a ‘fly on the wall’ at Max India, absorbing and learning every single step of doing business. A chance conversation with the CEO of a service apartment company, which Max was looking to buy, opened up Vachani to the concept of senior living. It piqued her interest. Helped by Bhalla, who was then taking a summer break for an MBA programme at Harvard Business School, she dug into the concept whole-heartedly. While ‘senior living’ had evolved in developed countries such as the US and the UK, it was a foreign concept for Indians. But time was ripe for it in India where an increasing number of seniors were living away from their children. Daily household chores were a hardship for them and they were most vulnerable to acts of crime. Bhalla, who formally returned to Antara after completing his MBA, and Vachani would walk up to aged strangers at airports and public places to know more about them and their needs. The duo would pose as customers and call up senior living companies in the US. They travelled across the globe, taking note of the best practices and concluded that there was an opportunity in India. Singh points out that Vachani was “lucky” to have parents who had deep pockets and were willing to support her. But he also drew a clear line to separate his role as a father from that as the chairman of Max India. In tune with good corporate governance practices, he took a backseat once Antara ceased to be just a family venture and came under the umbrella of the Max India group. “Antara had close proximity to other Max businesses that include health care and insurance. My experience of living abroad had also helped me realise the potential of her plan, especially when something like this was lacking in India,” says Max India MD Khosla. Once the proposal to bring Antara under the Max umbrella was floated, the venture had to be approved by the board of Max India. As Vachani says, “They [Max India directors] might have seen you in your diapers but they are tough cookies.” The real challenge was to convince them that this was not yet another real estate venture. “We were not looking to build, sell and then exit. Instead, we wanted to take responsibility of the services,” she says. Vachani diligently answered each and every question during the board meeting in 2012 that lasted almost a day. Till this point, Vachani has been sending the right messages about her intent in Antara. The bookings have opened a couple of months ago. “Real estate companies have a sales window of six months. For us, it is two years,” she says. The CEO has her plate full with challenges. Most important of these would be to complete the construction on time for which Vachani has chosen Shapoorji Pallonji & Co. Another critical element would be to get the service component right. The community centre will have a staff of up to 350 members and they have to be trained to be the ‘best in class’. “We are in the process of hiring a training manager,” says Vachani, who plans to have the full team on board 14 months prior to the opening day so as to have enough time for training. Success of the Dehradun project is crucial as she would want Antara to become self-dependent as soon as possible. The maintenance charge (from Rs 50,000 to Rs 2 lakh a month depending on the size of the residence) from residents should be enough to cover operating expenses. But its success will also have a bearing on future expansion and fund-raising options. Vachani has her eyes on plots in the National Capital Region that might host Antara’s second community. And if her first project succeeds, Antara might just have an external investor soon. Houses ranging from 2 crore to 7 crore with monthly charges from Rs 31000/- to Rs 1,85,000/- Is this community living for super rich. What class of middle class Indians fall into this category - I want to know. I am not even sure if this has started as there is no information on the company website. I am from dehradun and I also plan to start these - only difference is that i will made it free. Tara.... Good luck. Great article! The idea is not new its been here down south ... well its here for the masses though ( mainly middle class) not for the super rich class!! Perhaps the project of Antara is meant for only super rich people. I don\'t know what percentage of seniors retired in India can afford investing Rs. 2 crore plus for accommodation and the huge maintenance cost that will be Rs. 50,000 plus per month. How many such people prefer such facility against the one traditional Indian have gone for. However, I feel good that India will have so many to invest in the project to make it succeed.